stats to 811 routing to congested infrastructures and more. Could you give us a quick history of your employmentwith the City of Chicago? Council. The contract I handle includes locating all the underground infrastructure for the Division of Electrical Operations which is all the street and traffic lights, as well as the Department of Water Management and all of O’Hare Airport. 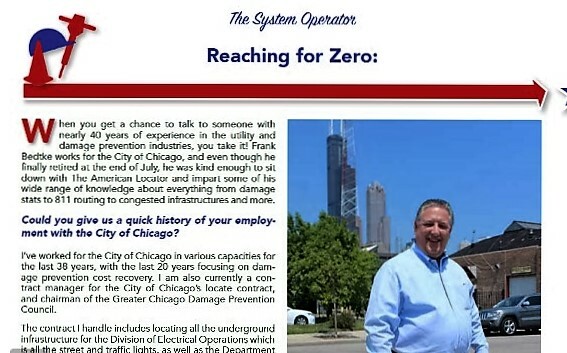 Could you give us a short overview on DIGGER, the one-call system in Chicago? The DIGGER system has been around since the mid-1970s, and has always had a simple software system but was recently updated on December 7th, 2015 to a user-friendlier version. It’s been entirely restructured to better handle ticket volume, and improves the range that you can actually put on a ticket. It’s there to protect the underground infrastructure and all the utilities within the Chicago city limits.